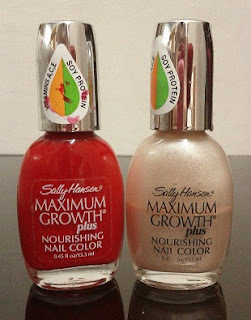 This is a review for Sally Hansen MAXIMUM GROWTH plus nourishing nail color with Vitamins A,C,E and Soy Protein. I am going to particularly review two colors: Profound Pink (a peach shade) and Sacred Scarlet (blood red), but I believe the rest of the colors in this range would be the same quality. Sally Hansen Maximum Growth Plus Nail Color is the first nail polish with vitamin technology. Patented formula hydrates and conditions. Soy Protein strengthens and fortifies nails. No DBP, Toluene or Free Formaldehyde. Read on to know what this so called 'leading mega brand of nail treatment and color' has to offer. I admit I am not a nail polish addict. I appreciate beautifully painted nails but I just don’t have the patience to sit and wait for my nail paint to dry. If ever I wear nail polish, I go for the ones that dry quickly and there are many available in the market now. Two years ago, I discovered my foot’s thumb nail had suddenly broken in one corner - not the grown part of the nail, but the actual pinkish part that has skin beneath it. I tried to file it, protect it, used creams, but nothing worked. It would just break every few weeks. How I wish they were actually as beautiful as they look in those glass bottles! This is the worst nail polish I have ever tried and in these last 2+ years I have just cursed the sales assistant every time I have tried to wear these nail paints. I applied a single coat and checked after 2 minutes of waiting under the fan. 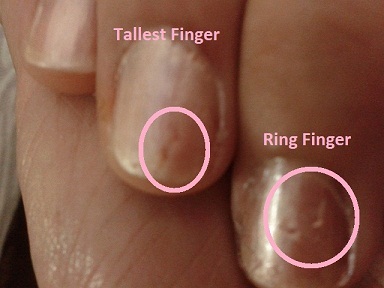 This is what happened to my ring finger upon touching. After 10 minutes, the nail polish is still not dry. I touched my thumb to check and it comes off like sticky bubble gum. 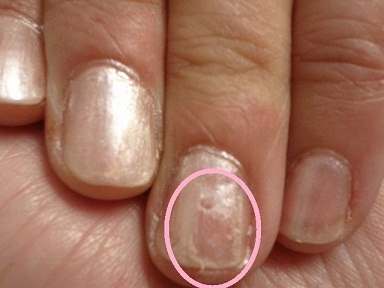 Can you also see the lines in the area where the nail polish is still intact? Even though the brush is quite long, which should mean neat nail paint application, this one gives you only textured nails and nail paint all around the skin. The brush does not evenly distribute nail polish on the nail. I could NEVER achieve a single neat application despite how much patience or precision I used. The color of the nail paint is very pretty in itself, but the consistency is BAD. When you take out the brush, it is too full of the paint. If you wipe off the excess nail paint against the bottle’s neck, you cannot paint even half of a nail. And if you try to paint with more nail polish on the brush, it just runs down to the edges and the brush leaves lines in the center. The nail paint does not dry even after 10 min of waiting arrrgghhhhhh!!! Finally when it dries, you will have nails that look like you have applied nail polish for the first time in your life. All clumsy, chipped and dirty. If ever you happen to get a better application, it does not stay for more than a day. No value for your time and effort. As if all this is not enough, it is quite a job to remove these nail paints. 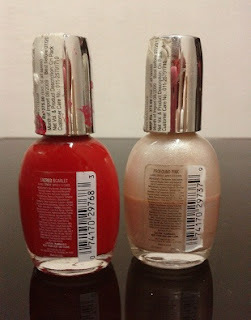 The Sacred Scarlet (Red one) just won’t leave your nails after cleaning them even thrice with a good nail paint remover. The other one (Profound Pink) has glitters, and glitter nail paints again take a lot to clean up. Forget growth, it didn’t strengthen my nails at all. The foot thumb nail kept breaking. Despite all the rave about this brand and the various nail paints it offers, I am done with it. I would never recommend this brand to anyone. Your problems with this polish is most definitely a "user error". I am guessing that you learned your lesson of not touching wet polish. Wear a quick drying top coat (there are a ton of them on the market but Seche Vite is the best). Dear I_Know_All_About_Nail_Paints, I would have appreciated if you had left YOUR NAME and a comment about your good experience with this product. Despite the fact that this comment sounds more like a personal attack, I chose NOT to moderate it and allowed it to be published, doesn't that tell you something about my honesty? The reviewed nail polish is toluene free and if I have to apply a toluene based top coat over it, doesn't it defeat the whole purpose of a chemical free product? Also, if I have to buy a top coat worth more than Rs 1100 to dry a nail polish that costs Rs 425 (in Indian currency), how wise is that? I didn't clean up this crappy nail paint from my cuticles because I anyways wiped off the whole thing after taking pics. Lesson learnt: You should chuck off a nail paint if it doesn't dry even after 10 minutes :) I am NOT a beauty blogger, but I definitely know there ain't any makeup available in the market yet to 'make up' for congenital dumbness.